2. Place the potato wedges in a large plastic bag or bowl and toss in the oil, paprika and seasoning. Spread them out onto a large baking tray and bake for 30 - 35 minutes. 3. Meanwhile, coat the gammon steaks with the mustard and place on a grill rack under a preheated grill for 7 - 8 minutes, turning half way. 4. Poach the eggs in boiling water according to taste. 5. 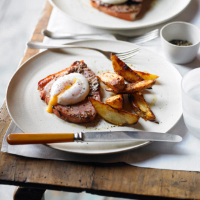 Serve the gammon with the wedges, topped with an egg.